You have found the perfect diamond: it has an excellent cut, the right color, and the perfect shape, but there’s just one last thing you have to analyze, the price. How can you really tell the value of a diamond? Many people overpay at walk-in retail stores because they don’t take the time to really learn what makes a diamond valuable, and how to assess a diamond’s price. The are some diamond price calculators that you can find online online, which allow you to punch in the basic information about a diamond and it will spit out a price estimate. However, the process of pricing is not always that easy. There are nuances to diamonds, every gem is different, so the pricing can vary, but you should still know some of the basics. Obviously when pricing diamonds, the Four C’s come into play: Cut, Color, Clarity, and Carat Weight. However, when you break down the numbers, most diamonds are priced per carat weight and the diamond price per carat. Nobody truly knows why, but in the diamond world, a 1-carat diamond costs 20% more than a 0.98-carat diamond with the exact same cut, clarity, and color. It’s very difficult to tell the difference between a 1-carat and a 0.98-carat diamond, and yet the fiscal value jumps extremely high for just a 0.2-carat difference. Why is this? Perhaps it’s because the 1-carat diamond is officially 1-carat, and that allows for bragging rights. Maybe? Unfortunately, the stress on carat-weight also sometimes forces diamond cutters to sacrifice creating the perfect cut in order to save an extra 0.2 or 0.1 carat. Cutters are encouraged to keep the diamonds at 1-carat so as not to lose that 20% cost value, however some gems look more brilliant if cut to 0.98 carats. That’s why it’s so important to not get obsessed with carat weight. Take some time to look at diamonds that are a fraction smaller. They may even be more brilliant than the 1-carat gems, depending on factors such as diamond fluorescence. Besides carat weight, diamond price can also be influenced by the other C’s, especially if it is an exceptional gem, such as a flawless or ideal-cut diamond. However, if you are buying a pricier diamond based on one of these qualities, you need to make sure that the diamond is certified. 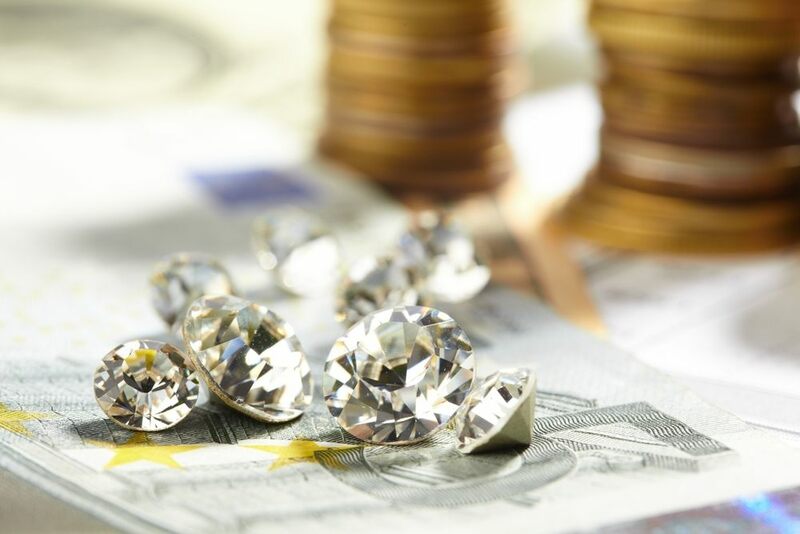 Online retailers do not have to worry about overhead in the same way that retail stores do, and for that reason online diamond sellers can afford cheaper prices for their diamonds. Brilliance.com’s Diamond Search Tool is a great way to help analyze diamond price as well. It’s always good to compare prices online in order to gauge what your diamond should cost. There are a number of tools out there that you can use to help you better guess a diamond’s price. Don’t just listen to a store’s set price. Talk to the experienced jewelers at Brilliance, look at the certification, and take the time to do your own research so you don’t overpay for your precious gem.